The SEBO essential G Series delivers effective carpet care, quality engineering and convenience features that are the essentials for a perfect vacuum cleaner. 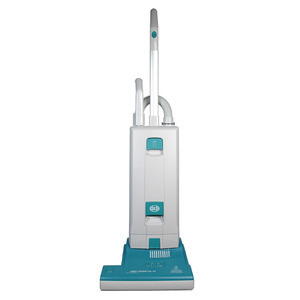 The Electronic Control is the brain of the SEBO essential G vacuums. It is equipped with warning systems and automatic shut-off capabilities that are designed to alert the user to machine problems such as clogs, full bag and brush obstructions. The Electronic Control will also tell you if you have the correct brush setting for opti-mum cleaning. The brush removes the dirt and hair and moves it to the suction chamber. The strong airflow carries the debris to the three-layer filter bag. First, the three-layer, full-size filter bag collects the vast majority of the debris. Then, any remaining particles are collected by the hospital-grade micro-hygiene filter. Finally, the micro-exhaust filter cleans the exhaust air that the vacuum emits. The S-class filtration system* as described above, results in 99.9% effectiveness to 0.3 microns making the SEBO essential G-Series vacuums the perfect choice for customers who suffer from allergies and asthma. The reinforced toothed belt on the SEBO essential G-Series vacuums will not slip or stretch resulting in a more efficient use of power and should last the life of the machine. The SEBO design goes deeper than superficial styling. SEBO vacuum cleaners are built to work. They are easy to maintain and simple to use. Changing the filter bag is simple and clean - when the bag is sealed, no dust can escape. Removal and maintenance of the brush roller requires no tools! Double-size electrostatic exhaust filter for improved air quality. The entire machine is user friendly and can be disassembled in minutes (no tools are necessary). Finding and clearing blockages has never been easier. The order was received quicker than quoted. We are very happy with the products we received and would do business with you again, should the need arise.